Building brand personality for a new start up in a highly competitive sector. Prism Outsourcing approached us as a new start-up in the recruitment sector. With clear strategic direction and a firm business plan, they already had a company name but no visual identity or brand personality. With an extremely tight deadline of 4 weeks until launch, it was clear that the project would have to be right first time. Our first step was to create a daily schedule, which would be the critical driver to ensuring that all parties delivered on their areas of responsibility. With such a short lead-time, cross-party communication and fast decisions would determine whether the project would be completed on time and on budget. In line with the schedule, we spent time with the client on a marketing workshop, gaining insight into the proposition. We covered research (internal and external), brand & proposition analysis and a market assessment. After this period of close collaboration, we were then able to formulate strategies, covering message development, brand positioning as well as helping to shape the corporate mission, vision and values. The brand identity was created to be fresh and dynamic, representing the blended, holistic approach offered by Prism. 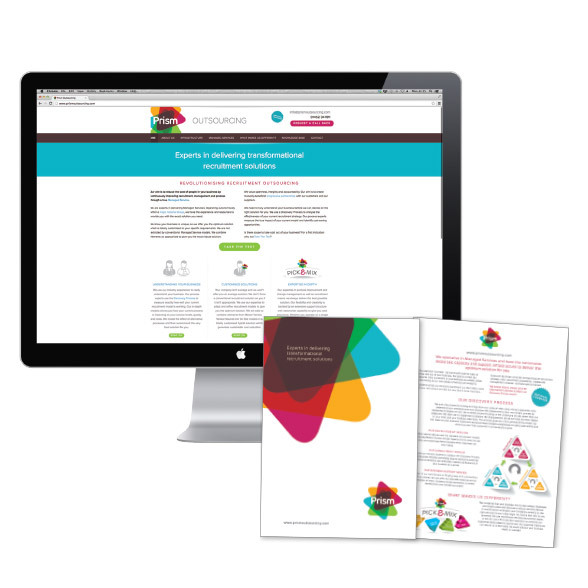 Considerable time was spent on the website, as we worked through audience prioritisation and user journeys to enable targeted, specific content generation with a key focus on White Paper creation to help reinforce the expert positioning. The content was developed using our specified language palette and defined tone of voice to ensure that the website fully supported the brand.